freifunk.net | English | Meet Freifunk people in May and August! The day before our annual Wireless Community Weekend starts, the OpenTechSummit will take place for the first time in Berlin, Germany at the “Kalkscheune” venue close to Friedrichstraße station. Topics range from open hardware to design, graphics, software, networks, knowledge and digital policies. There will be DIY workshops for kids and techies. Freifunk will present itself with an information desk and provides workshops e.g. on upgrading Wifi routers. After the evening there will be an “OpenTech-Himmelfahrt” lounge. You can find information on the schedule and how the get tickets on the OpenTechSummit website. Like every year german speaking communities will meet with international guests at c-base in Berlin. The „official programme“ starts at May 15th and lasts until May 17th. In fact, the final version of the agenda will be created by attendents on-site. If you add your idea or wishes to our wiki upfront, we can take care of your talk or workshop. Hack sessions are taking place the whole time. This year we focus on topics like crypto, IPv6 and new services, but also like always latest firmware, new installation setups and last not least legal and political update plus public relations. We’ll also build an advisory council to settle on disputes and write down a Memorandum of Understanding on freifunk. Following the tradition we’ll have barbecue in the evening hours at Spree beach and we don’t charge entry fee. For more information and taking part, please look at http://wcw.freifunk.net. Add your ideas and proposals for workshops, talks or projects to our wiki. If you have limitations on time, please make a note to your proposal. Our timetable will be compiled on runtime. Please add yourself to the list of participants, too. If you need accomodation, or if you can offer a couch, add it to the accomodation page. We’re excited to meet you in Berlin! 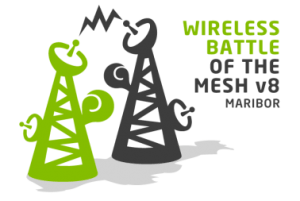 The battlemesh is free of charge and open for all, every year we strive to keep participation costs low by negotiating deals for accommodation and food. This year the event will take place from 3rd to 9th August 2015 in Maribor, Slovenia and will be hosted by Wlan Slovenia. If you are interested in dynamic routing protocols or wireless community networks you can’t miss this event! You want to talk about topics in this context? Propose your workshop or talk until May, 1st. Here’s the official announcement. The Chaos Communication Camp in Mildenberg is an open-air hacker camp and party that takes place every four years, organized by the Chaos Computer Club (CCC). Thousands of hackers, technology freaks, artists and utopians get together in a field for five days in the Brandenburg high summer – to communicate, learn, hack on things and party together. You can find Freifunk communities at the Freifunk Hacker Village. Visit us there, bring your tent. Place of the event will be Ziegeleipark Mildenberg. Hackers will meet there from August 13th to 17th. Prices for tickets aren’t fixed for now, but a pre-sale is announced. Save the date for a summer vacation with like-minded people, including working hand rail trollies and locomotives! darum installieren wir mit solar, computer n schulen, wo kein elektrizitat netz und internet gibt. wikipedia, bibliotek und videos auf einem raspberry pi mit wireless access point installiert. wir moechten weiter und dieses service nicht nur rund um die schule zu verfuegung stellen,a ber fur ds gesamte dorf. damals war ich bei der openwireless.ch und wir habe linksys mit freifunk software isntalliert und so grossse flaeche erreicht. ich stelle mit so etwas vor. kann so ein treff mir helfen fuer “mein” projket? Hi, I’m looking for someone that could help us build/integrate mesh capability into a new hardware project we are created. Any help/introductions would be appreciate.